BEIJING (Reuters) – The eldest brother of blind Chinese activist Chen Guangcheng said he was beaten up on Thursday by two men he said were government-hired thugs, which would mark a sharp escalation in harassment meted out to Chen's family. 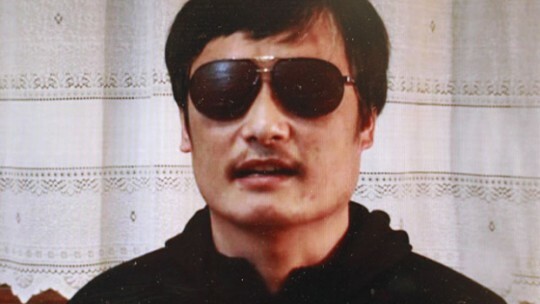 The treatment of Chen Guangcheng's family has received prominent attention from the United States in recent weeks and could cause further friction between Beijing and Washington over human rights. Chen Guangfu said he was beaten by unidentified men in what appeared to be the latest incident of harassment of Chen Guangcheng's family since mid-April, around the anniversary of his escape from 19 months of house arrest. Chen Guangfu, 56, said two young men punched and chased him as he was heading home to his village of Dongshigu in the eastern province of Shandong. The men, who appeared well-dressed and in their 20s, jumped out of a black car and hit him repeatedly on the head, he said. He said he was not seriously injured in the beating that lasted several minutes. "I started shouting and running away from them at the same time," Chen told Reuters by telephone, about 10 minutes after the incident happened. "This is a continuation of what has been happening to me since April 18," Chen said, adding that he believed the men were government-hired thugs. "My feeling is that they didn't appear to be farmers." Police in Linyi city, which has authority over the village of Dongshigu, could not be reached for comment. Chen Guangfu recently told Reuters that security personnel had carried out a nightly harassment campaign, throwing rocks, bottles and dead poultry at his house for 12 nights in a row. Chen Guangcheng, who made international headlines last year when he escaped house arrest and spent 20 hours on the run before finding refuge at the U.S. embassy in Beijing, called on the United States last week to ensure his family in China was treated fairly. Chen Guangcheng's decision to take refuge in the U.S. embassy was deeply embarrassing for China, and led to a diplomatic tussle before China allowed him to fly to the United States with his wife and child. U.S. Secretary of State John Kerry tried calling Chinese Foreign Minister Wang Yi to discuss a nephew of Chen's who has been imprisoned but Wang was not available, the State Department said last week. Chen Guangfu's jailed son, Chen Kegui, had been diagnosed with appendicitis and urgently needs medical care, Chen Guangfu said, but he had not been offered surgery for the condition. Chen Guangcheng is a self-schooled legal advocate who campaigned against forced abortions. He was jailed for four years on charges that he and his supporters said were spurious, and then held in his village home for 19 months after being released. This entry was posted in National Security and tagged Chen Guangcheng, China. Bookmark the permalink.